This is housing that ordinary workers can afford on their average wages and lending @ 4 X income. A council has a duty to provide affordable housing, currently in the ratio of 35 houses with capped rents (or sale prices) to every 65 houses built at current market value. Developers should take note and build this into their calculations when applying for planning consents. Thirty-five percent (35%) seems to us an odd figure to settle on, because you can't build 3 1/2 (3.5) houses out of ten. You either build 3 or 4 affordable houses out of ten. Thus, 40% would have been a more appropriate figure to aim for. Taking the present application as an example, out of the proposed 70 houses, 24.5 would need to be affordable and 45.5 of market value. Impossible to achieve of course. Who would buy the two half houses? At 40% things improve, giving us 28 affordable and 42 at market value. Henceforth, houses that are affordable are to be mixed in with houses of current market value and should not stand out as being cheaper or inferior, but should blend in. In the old days houses were built on council estates that tagged occupants as being of a lower class. Thank heavens that in an integrated society that is now a no go. The new rules address an imbalance in the provision of house stocks left over from when council's were allowed to sell off their estates and not build replacements. Crazy yes, but that what comes of politics and massaging the figures. It always leads to problems later on. 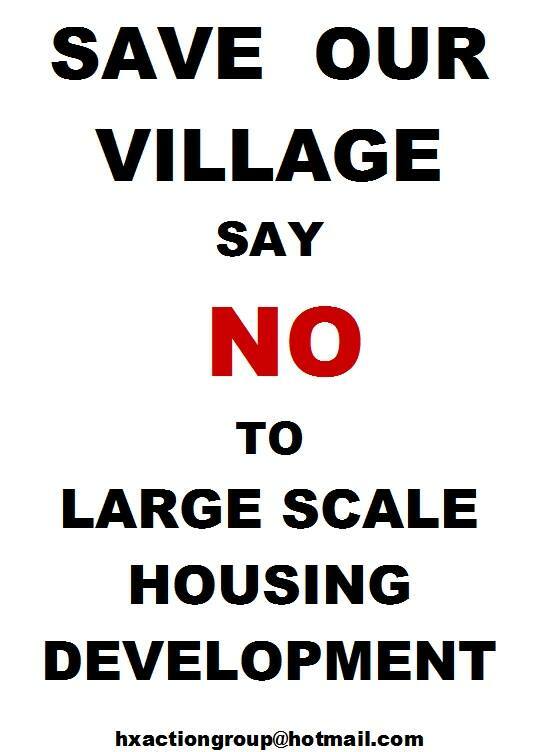 Local Plans have now been adopted that force developers to build houses that they would rather not - because of course, it dips into their profits - in some cases to the point where a development is not viable. 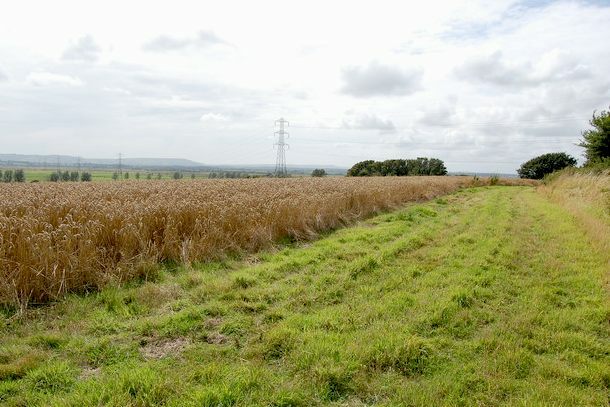 On the positive side, land that could never have been used for building houses previously, is suddenly given a new lease of life as policies are torn up by councils desperate to find builders willing to take a gamble. Hence the mad dash by landowners to capitalize on the current policy shuffle - or as you may prefer: shambles. Banner put up in support of the protest by the Herstmonceux Action Group, on the North facing garden fencing of the Old Rectory. The owners of the Rectory building are potentially one of the most affected by application: WD/2015/0090/MAO. They have enjoyed views across an open field to the village and playing fields, since they moved house in about 1987. 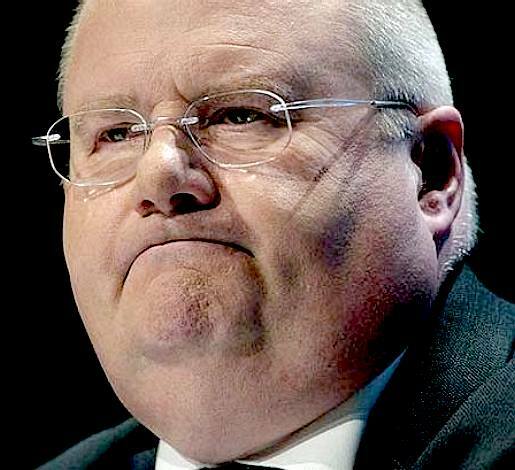 After the General Election in 2010 David Cameron appointed Eric Pickles as Secretary of State for Communities and Local Government, that followed his appointment as Chairman of the Conservative Party in 2009. According to the Mirror, in 2011, the Tory Minister failed to declare a luxury Savoy dinner he enjoyed with lobbyists. The Local Government Secretary dined with staff from public relations firm Bell Pottinger, but failed to report the meal because he claimed he was eating privately. The decision was criticised in the House of Commons by Labour MP Paul Flynn (Newport West). Speaking at Local Government questions, Mr Flynn said: "Even though a five-star dinner at the Savoy, which was paid for the lobbyist Bell Pottinger and had in attendance at least one firm which made an application to his department, the Secretary of State says he has no reason to register that in the Members' Interests because that day he was not eating as a minister, he was eating as a private person." It's an interesting concept that. But can an MP eat out as anything other than an MP. It's not a real loophole of course, more a convenient state of mind. "If we are to have a robust, transparent system of lobbying, do you think this loophole has to be closed so we don't have to guess on which day Members are eating privately and which days ministerially?" Alternatively, why not have a system where the MP concerned has to declare when he is eating out privately when lobbyists share the table. You cannot survive in politics without a gaff or two, so long as you perform when it really matters, as in this case of over-development in the country and clear abuse of his department's policies.
" I've come here expecting Chairman Pickles to be in a state of high excitement but, as usual, he moves through all this febrility like a hippopotamus through mud: slowly, calmly, and with weird grace." - Rachel Cooke’s profile of Eric in The Observer 24th May 2009. "The man is - and always has been - an absolute star." - Iain Dale of "Iain Dale's Diary"
Never before has there been an action group representing the interests of so many residents in this peaceful Sussex backwater. To date, planning battles have been contained, such that local people were content to let neighbours object to smaller residential developments. This all changed when a former estate agent was seen surveying Lime Cross and speaking to neighbours about his intention (or the intention of family members) to apply for planning consent for up to 70 houses, where for many years Wealden District Council and the Parish Council have been saying there should be no development. The proposed site is outside the historic village boundary. This application is not only contrary to Wealden's Local Plan, but is considered by many to be downright dangerous. The A271 is a narrow country road that is already overloaded - with many traffic jams in the village high street causing motorists serious delays on occasion. Thank you for your letter dated the 22nd of January 2015. Please find attached, copy of our letter to ESCC dated the 2nd of February 2015, which we think sums up our concerns at the moment and by way of objecting to the proposed development. Could you therefore please place the letter to Mr Chuter and this letter on your file for the members to consider is due course. We should also like to book a slot to make representations at any public meeting where this application is being considered. Could you make note of this request and please let us know well in advance, the dates when we should arrange for our representative to attend your offices to be able to address the appropriate Committee. Could you also let us know on an urgent basis, if, or when your council intend consulting English Heritage or the Department of Culture Media and Sport as to the issues raised? We look forward to hearing from you at your very earliest convenience. RESIDENTIAL STATUS - The building in the foreground is immune from enforcement by virtue of the 4 year rule. It was not included in a notice served by Wealden in 1986, because it did not exist at the time. It is unfortunate for this council that their notice from 1986 is deemed to have been obtained using tactics that amount to fraud according to the Fraud Act 2006, which Act also did not exist at the time. The view from the French-window style double-doors (shuttered) that face into the proposed site, is a planning consideration, being the main entrance and having glass doors as a new security provision. Clearly, the privacy of the occupiers and the privacy of any houses that may be built, is compromised. In addition the view to the north-east to the Area of Outstanding Natural Beauty (AONB) would be interrupted by the proposed housing and no amount of mollycoddling can overcome such objection where around 18 of those proposed are in line of sight from Herstmoncuex Museum and a further 14 houses interfere with the line of sight from the Old Rectory. The picture below shows a view from the Jubilee Trail north to Herstmonceux Museum. The planning proposal will fill this view with 2 storey houses, so obscuring it forever, preventing access to and enjoyment of this historic building by the public. The oak tree on the right in the picture, is seen center of the quadrant to the east in the site block plan. The picture above is a timeless shot of the public footpath (Jubilee Walk) that leads from the village playing field, past Herstmonceux Generating Works on the left, towards Herstmonceux Observatory, about a mile further south. The oak tree just right of centre is also a landmark known to all the villagers and ramblers. It should perhaps be protected and listed. If this development is allowed to go ahead, access to this heritage site will be obscured by housing. Worse, an already "at risk" building will be placed at greater risk. Why? Consider the loss of security with dozens of curious youngsters from the suggested 70 houses climbing over hedges/fences, etc, relatively un-obscured, whereas at the moment such approach is easy to spot across an open field, and so discourages vandalism, thefts, etc. Indeed, the army of dog walkers and ramblers who enjoy such open space, operate as an unpaid guard, tending to discourage misuse of the public footpaths - which would if shrouded by alleys of housing, become super-highways for youthful misadventure. Also increasing the chances of burglary. This is after all a vulnerable timber building. We would like to know how such newly created security issues are going to be dealt with, where this unique heritage asset is already At Risk? A housing estate as a blind, will be making a vulnerable building more vulnerable, and possibly a target. Who will pay for any damage occasioned and will there be an insurance fund to cater for such eventuality. One can imagine the disturbance from 140 potential juvenile delinquents (@ two children per family), looking to get up to mischief. What better then, than a clandestine visit to an unusual building that is no longer protected by an open vista. It is because Council's have been dragging their heels so much and not planning for new housing that we are in this mess. it is not just Wealden, it is ingrained in civil servants to apply rules to prevent development or change. In this case the problem is so bad that central government has had to direct them to change their attitudes. Fantastic, but why give locals the job of developing (in effect) national policy in the first place. National policy is what counts. Where do we need homes in the UK and what elements of the countryside are essential to preserve. A Herstmonceux local is not concerned with Battersea Power Station or Rudyard Kipling's home at Burwash. He or she, only sees this field at Lime Cross in isolation. This brings us back to economically viable housing for locals who are on the housing list, and then making provision for those who will be signing up once they realize that sensibly priced housing has been made available to locals in Herstmonceux. If we are to break with restrictive policies, this should be for genuinely social housing. As an example let us say that 50 houses are built that are for regular landlords: 50 X £350,000 = £17,500,000. That is seventeen and a half million pounds, one hell of an incentive for a land owner to turn his back on the true requirements of the village. Now let us look at a genuinely affordable housing scheme involving 50 houses: 50 X £70,000 = £3,500,000. That is £14,000,000 less for the developer. This would be £14 million that is earned on the backs of all of those men and women in the UK who cannot afford to buy their own home, because we keep giving planning consents for houses that nobody can afford, to keep the rich, rich and keep the ordinary man further away from home ownership. In other words, more deeply enslaved. This is an elitist practice that discriminates against poor people, that is perpetuated by the state (at the moment) - hence is potentially an Article 14 (discrimination) violation in combination with an Article 17 (state practice that impinges on another Article) violation. As we have no Article 13 in our Human Rights Act 1998, by design of the government, we also have no effective remedy. That was the whole point of leaving out Articles 1 and 13 from our home grown version of the European Convention, to deprive the nation of a means to challenge hundreds of identified HR breaches, without going to Europe - and Europe has tightened up their application rules so that if one "i" is not dotted, they will reject the application. The reason for Europe being so unreasonable is to try to reduce the backlog of cases, not in any way to do with justice. In allowing the developer to get away with his plan to build as many expensive houses as possible, we are allowing the village of Herstmonceux to move further away from its village roots than ever. We are driving our local workforce away and pushing local people, who might otherwise have remained local, to move elsewhere to find higher paid jobs to have any chance of ever affording their own home. This is not a sustainable practice and should be discouraged. If approved, this planning application sends a signal to all other land owning developers in the UK that they too can profit magnificently from a recent loophole that allows them carte blanche to build anywhere they like. 25 - 45 25 x £70,000 = 1,750,000. 45 x £350,000 = 15,750,000. Giving us a total value of the development as being 17,500.000. Divide that by 70 units and we have an average value of £250k per house. More than enough to get the salivary glands of the developer's bank manager flowing. More realistically the market value houses will be nearer £250k per unit = 11,250,000. Add that to the 25 affordable units = £13,000,000. Then divide that by 70 = £185,7k per house as the budget target. From this figure we have to deduct build costs, legal fees and contributions to local infrastructure. The problem is that build costs for the 25 affordable houses (AHs) will not be that different to the 45 at market value, because of the requirement that the 25 AHs blend in. If the build costs are £150k per unit that equals £10.5 million, giving a profit of £2.5 million, minus £0.5m for contribution to council services for the development = £2M. Then we must deduct the costs of access roads to an adoptable standard and general landscaping. Looked at that way it begins to look like a whole lot of work for very little return - and we still have legal fees to deduct. Obviously, if the build costs are less, then the profit is higher, but then we cannot skimp on quality of the builds or face litigation for breach of contract - in this case a 106 planning obligation. What then if the development leads to compensation claims against contamination in the future? 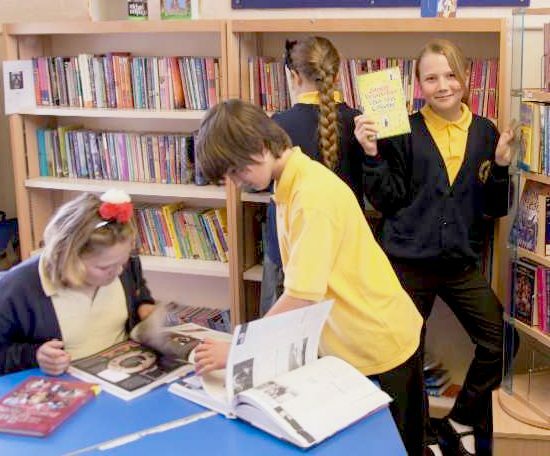 TRAVEL GRANT CUTS - On Tuesday (April 29 2014) campaigners collected more than 100 signatures for their petition from parents with children at Herstmonceux Primary School, who will be affected by the change. What will this mean for the proposed 70 new families, who would not in any case have primary school places locally - where the school seen above is full to capacity. 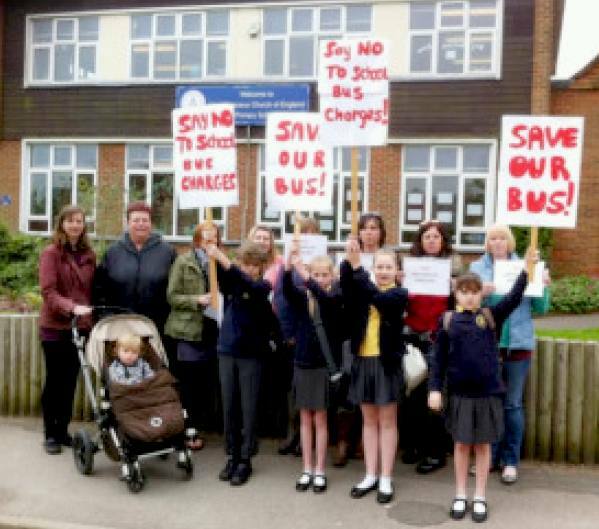 Parents in Herstmonceux launched their campaign to win back free school buses to transport their children to secondary school. Earlier in 2014 East Sussex County Council proposed to axe some of its free bus services for children to help save £78.5m. A spokesman for East Sussex County Council said: “We appreciate there are strong feelings on this issue but at a time when we are facing significant cuts to our budget, difficult decisions have to be made. In most parts of East Sussex, eligible children already only receive free transport to their nearest school, and these changes will mean the system across the county is clearer, fairer and more equitable. We are reliably informed that the village school if full to capacity. Where then will all the children who live on this new housing estate be educated? The local surgery is also full to capacity. How then will the village cope, when such basic infrastructure is not in place to support another 50-70 families. Sustainable practice demands that local people should be served locally. Otherwise, transport costs and all the pollution that goes with it, have to be added to Britain's carbon footprint. So much for Zero Carbon Britain. DRINKING WATER CONTAMINATION - You can see from the levels in this photograph that the ancient well used by Herstmonceux Museum for all of its water supply is subject to contamination that will arise if houses are built above the water table. If you check out the plans for the proposed application from December 2014 and January 2015 (they are identical save for the name of the applicant) you will see that houses are suggested on the slope leading to the Museum. It is thus inevitable that the water supply to this unique heritage asset will become contaminated if the proposed development is allowed to proceed. Herstmonceux Museum is the building above and to the left of the magic blue mushroom in the foreground. This is surely not what the Secretaries of State are advocating, where the drive at the moment is for a closed loop economic cycle. The Secretary of State should thus be invited to call in this application if it is passed, either locally or on appeal. For it strikes at the heart of sustainability and what constitutes sustainable practice. It could thus become a test case. 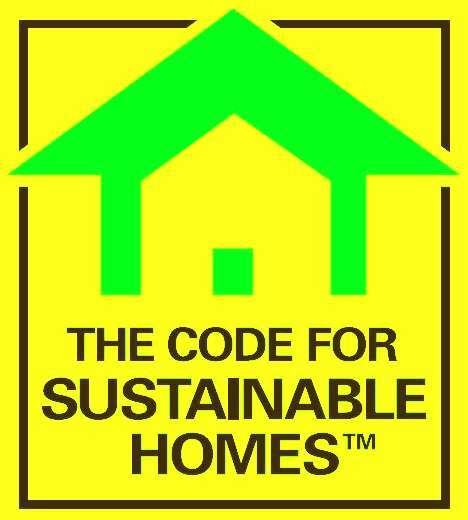 Will the proposed houses be zero carbon? Will they (macro) generate their own electricity? Will they take advantage of the sunshine for solar heating and how well insulated will they be? Will there be charging points for electric vehicles? We doubt it, but new builds should be zero carbon, with fewer draughts, double or even triple glazing and features to harvest energy from nature, to offset the increase in housing energy needs. JUNGLE POLITICS & FINANCIAL SLAVERY - "BINGLE, BANGLE BONGLE, I'M SO HAPPY IN THE JUNGLE"
In the jungle we are charged no rent for the tree we swing in and nothing for the bananas we eat. We have all we need free of charge to produce our offspring. Along comes man to enslave his fellow man. The first thing we do is to start charging for the right to swing in a tree. We also charge for bananas, because we now want to profit from territorial rights that should not exist on a tree that we don't need - hence greed is the motivation. The problem got worse with the invention of money, to simplify barter, coupled with the concept of ownership of natural resources and sovereignty, for exploitation. There is nothing wrong with owning land to farm or to build your own home. The problem comes with land speculation, when land becomes another commodity to be traded for gold, not affordable homes. The issue is control, just like insider trading is illegal. One common term to derived from such social abominations is: "The Rat Race." We prefer the term "Financial Slavery" and it should be abolished, because it is no less evil than enslaving people to grow cotton or harvest rubber for profit. It's all about profiting from the labour of others. Two glaring omissions from Wealden's list of consultees, are that of English Heritage and the Department for Culture Media and Sport. We are shocked to learn that English Heritage has not been approached, where it is their Monument at Risk programme that is a topic for discussion. It is equally disturbing that where tourism is one of our biggest exports, that a unique historic building is in danger of being excluded from any tourist's route by this application that is demonstrably insensitive to the need to attract overseas visitors. In all the documents cited so far, there is no "Tourism Statement." Herstmonceux is a village that depends on visitors for income. 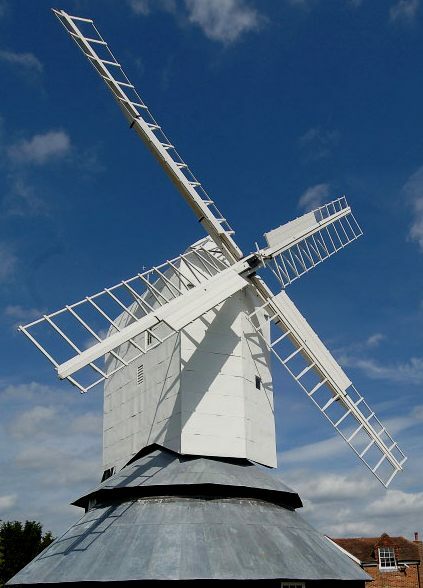 The sites that tourists are likely to visit close by are Batemans and Windmill Hill. Some of these visitors, whether industrial archaeologists keen to see one of the last coal fired power stations (Battersea) or Rudyard Kipling fans, will want to see the sleepy little village of Herstmonceux where an electrical industry thought leader, The Baron de Roemer, was building his electrical supply empire, having sated his own desire for clean light and cooking. Not that long ago we lost the Truggery, and to many that was a tragedy in tourism terms - and all because our local councils have no real vision. They just do not understand or value what they have, or had. They are sheep, blindly stumbling from one disaster to the next catastrophe, in the process destroying the country scene. Why? Because visionary leaders do not go into local politics. Local politics is all about local control for the favoured few. These poor cattle will be made homeless. 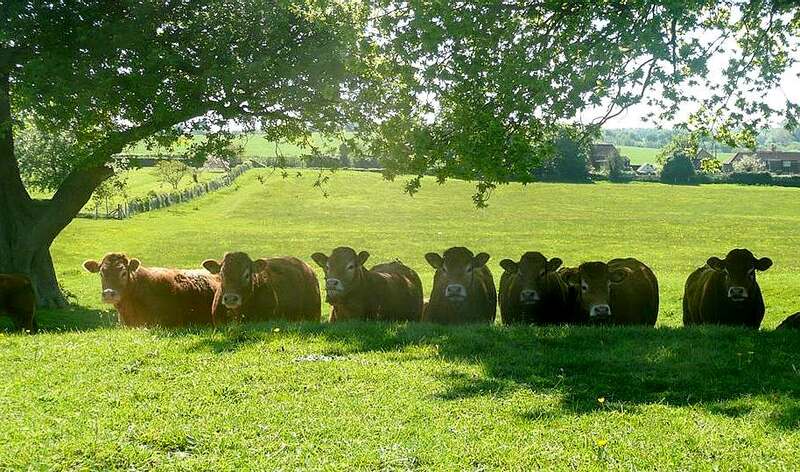 A long time feature of this particular country walk is the livestock that grazes the field in summer months. They are an attractive feature that adds to the character of the village. RURAL UNDERSTATEMENT - One of the very few old industrial timber buildings in the UK. The generating works at Herstmonceux is a rare find that could just as easily become buried under a housing estate. If we are going to allow the building of houses on green belt, would it not be better to allocate fields that don't have a history to ruin. There are thousands of acres of flat farmland in this vicinity that would not spoil an interesting tourist attraction. EVEN MORE LOCAL HISTORY - James married Sarah Shorter who had recently had a son Robert. Although it is not clear who Robert's father was, James certainly took on that role. 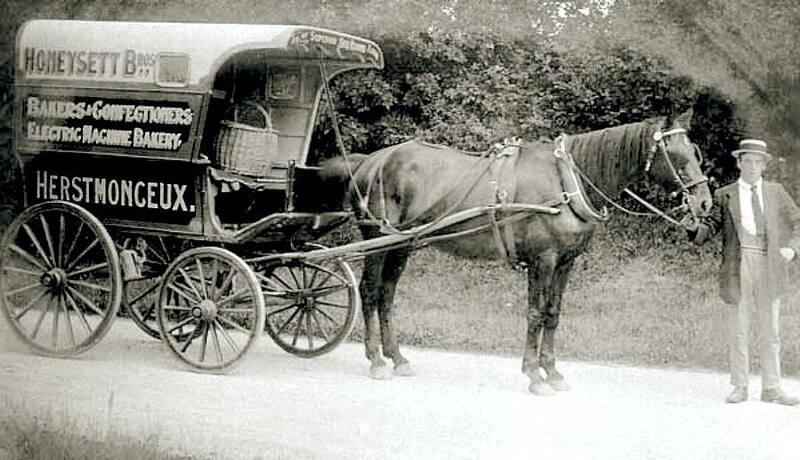 Two of Robert's great-grandchildren, Stephen (1880-1940) and Robert Honeysett (1884-1912), were bakers and confectioners using the latest electric baking machinery as is clear from the sign writing on the side of this horse drawn wagon. Herstmonceux Bakery was one of the few in England at the time that could boast such innovation - all due to the Baron de Romer and his generating buildings in Lime Park. This photograph is from an old postcard courtesy of Mick Hall. In 1982 one villager told the Museum's curator that he would stand at the top of Lime Cross hill and look down to the village, where he could see the lights in the Bakery growing bright then dim in time with the sound of the generating engines in Lime Park. This picture is evidence that that conversation was more then likely factual. We do not know the name of the gentleman telling that tale. We are just pleased to be able to relay it to you. 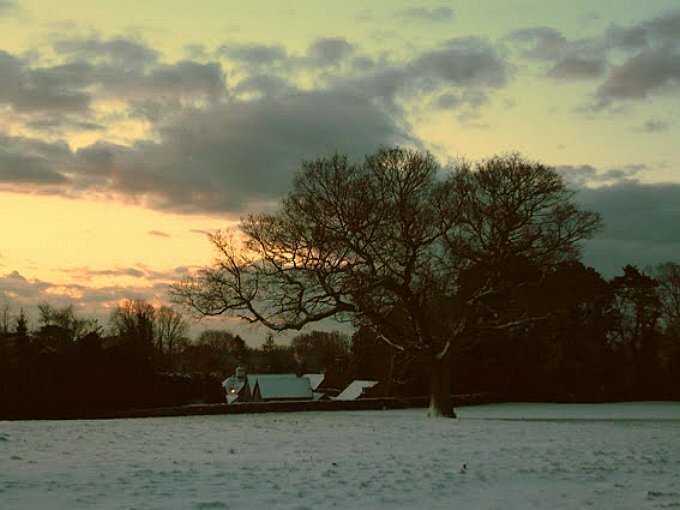 WINTER SUNRISE - January 2009. The snow has settled overnight on the hamlet of Flowers Green. Lime Park is a private estate off Church Road, on the way to Herstmonceux Castle. The generating buildings are an attractive and familiar feature in the landscape. This view will be lost forever to walkers if the proposed planning application is granted consent. MMP EARLY ELECTRICITY GENERATION - Battersea Power Station (seen above) in London, is one of the other two buildings on the same Monument Protection Programme as Herstmonceux Museum. The other building is Batemans at Burwash (seen below), the home of Rudyard Kipling. 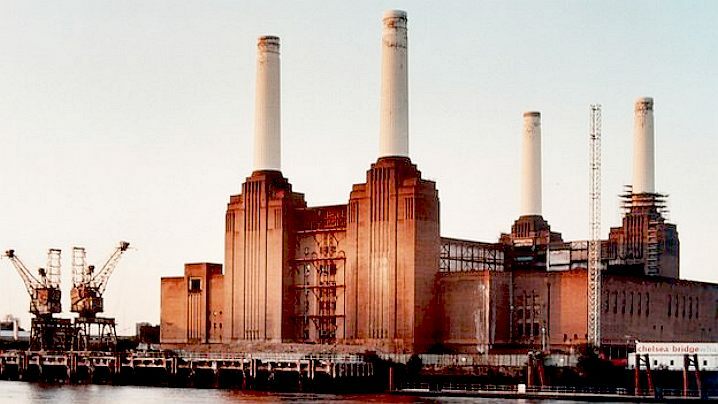 Like Herstmonceux Museum, Battersea power station supplied electricity to homes and businesses in and around London, linked to other stations (that have now been demolished) via the National Grid. Batemans only generated a small amount of electricity, in fact just enough to power 10 light bulbs in the house. 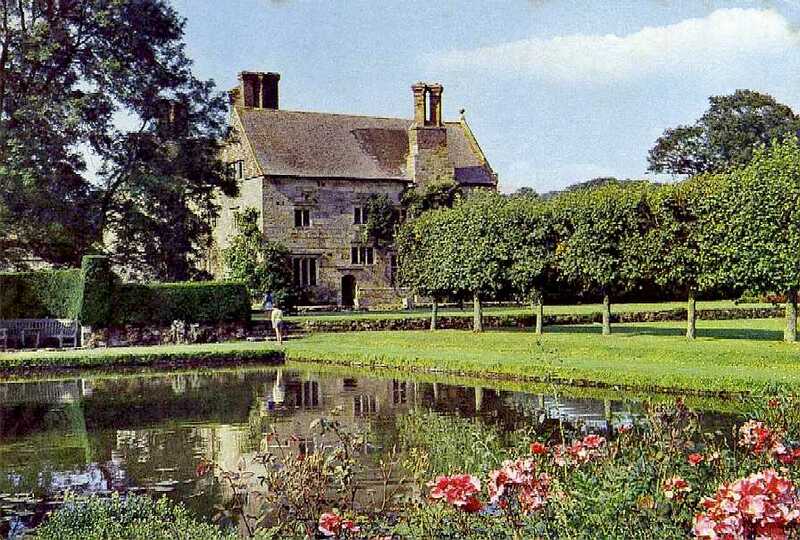 Batemans is a 17th-century house located in Burwash, East Sussex, England. Author Rudyard Kipling lived in Bateman's from 1902 to his passing in 1936. His wife left the house to the National Trust on her death in 1939 and it has since been opened to the public. Bateman's is a modest Jacobean Wealden sandstone mansion built in 1634 for a local ironmaster, John Brittan. Six brick columns form a massive central chimneystack above the gabled facades. Today the rooms are left as they were when the Kipling family lived there, much as we are doing our best to keep the rooms at Herstmonceux, as they were when lived in by the local inventor. EARTHSHIP BRIGHTON - Sustainable building depends on design choices in terms of architecture, systems and materials. Some natural buildings are mainly defined by choice of material. Cob building, for example, can be used to build beautiful homes using earth from the site, but often with limited integration of appropriate systems. Other approaches can be more holistic, none more so than earthships. There are many ways you can break free of the shackles of society, and these days it is fashionable to use alternative technology to make a cave for yourself without being labeled a hippie. There is of course nothing wrong with being in touch with mother nature. If you want to see the inadequacies of the proposed entrance to this site, visit the Herstmonceux Action Group's Facebook page, where there is some superb video footage, clearly spelling out the traffic dangers from a 90 degree entry to the busy A271, with virtually no visibility splay, and traffic calming measures that add to what could be a very confused accident black spot.